There is so much to love about this stunning South Maui wedding held at the oceanfront estate of the White Orchid Beach House. Lindsay married her love, Robert on a beautiful sunny day under a grove of palm trees gently blowing in the breeze. Saying their vows in front of their small party of just forty guests, the bride was a vision in her flowing gown while her groom, handsome in his custom blue tuxedo. 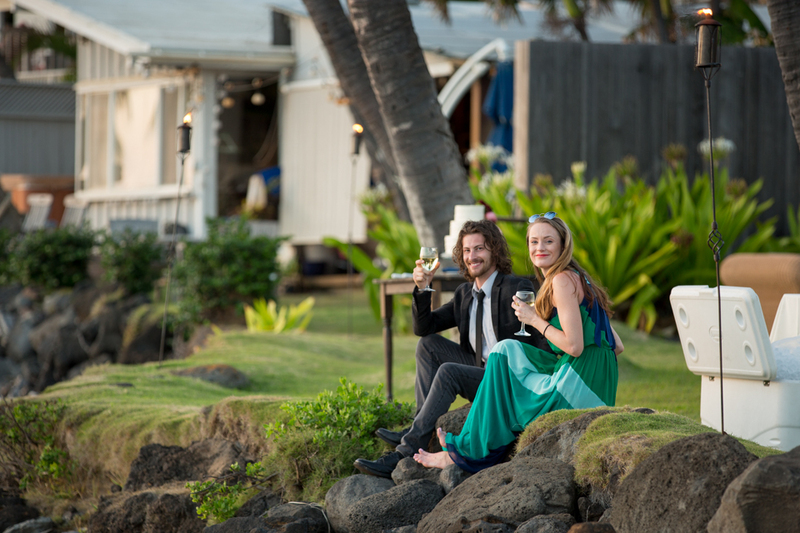 Event designer, Kendall Higashino was able to create an affair to remember, bringing to life the couples vision for their perfect Maui wedding. Not one detail was spared to create a decadent setting. Vibrant florals of garnet, magenta and pink roses, gold rimmed glassware, navy linen napkins and mercury glass candle holders adorned the wooden farm tables which sat under a clear top tent so they could look up at the sky when the stars came out that night. The bridal party was decked to the nines as well, the ladies in sparkly gowns and the gentleman in crisp light suits. This wedding is straight out of the pages of a fashion magazine. Once the ceremony was over, guests feasted on local cuisine, sipped on craft cocktails and danced the night away to the beats of DJ Sol with the bride proclaiming that her wedding day was the “Best day of her life!” We were happy to be able to capture it for the lovebirds so they can look back on the happy memories for many years to come. Congratulations Lindsay and Robert, we wish you a lifetime of happiness!